Sept. 4 (Bloomberg) -- Crude oil traded little changed near $68 a barrel on speculation that OPEC will keep quotas steady as it is satisfied with current price levels. The Organization of Petroleum Exporting Countries will probably keep its target at 24.845 million barrels a day when ministers gather on Sept. 9, according to all 26 analysts surveyed by Bloomberg News. Japanese and Australian stock futures climbed today as U.S. retailers reported greater-than- forecast sales. Crude oil for October delivery traded at $68.19 a barrel, up 23 cents, on the New York Mercantile Exchange at 10:23 a.m. Sydney time. Yesterday, the contract fell 9 cents to $67.96. Prices are poised to fall 2.6 percent this week. The Standard & Poor’s 500 Index rose 0.9 percent and the Dow Jones Industrial Average increased 0.7 percent yesterday. There will be no floor trading in New York on Sept. 7 because of the Labor Day holiday. The Shanghai Composite Index climbed 4.8 percent, the most since March 4. Futures on Japan’s Nikkei 225 Stock Average expiring in September finished at 10,240 in Chicago, up from 10,200 in Osaka and 10,215 in Singapore. Those for Australia’s S&P/ASX 200 Index gained 0.6 percent in Sydney. “We’re looking toward the labor numbers tonight in the States and that will be the key as to the near-term direction of crude,” Barratt said. A Labor Department report today may show payrolls fell by 225,000 in August and the unemployment rate rose to 9.5 percent, according to a Bloomberg survey. The economy has lost 6.7 million jobs since the recession began in December 2007, the biggest employment slump in any post-World War II economic downturn. Brent crude oil for October settlement fell 33 cents to $67.33 a barrel at 10:17 a.m. Sydney time on the London-based ICE Futures Europe exchange. Yesterday it dropped 54 cents, or 0.8 percent, to end the session at $67.12 a barrel. Sept. 3 (Bloomberg) -- Gold jumped to a six-month high, reaching $999.50 an ounce, on speculation that a weak dollar will boost demand for precious metals as an alternative investment. Silver climbed to the highest price in 13 months. Gold has gained 4.6 percent this month in the biggest three-day rally since March. The euro has rallied 13 percent against the U.S. currency in the past six months. Gold tends to rise when the dollar weakens. The U.S. Dollar Index, a six- currency gauge of the greenback’s strength, sank as much as 0.5 percent today before erasing the decline. “The dollar is going to be the main driver for gold strengthening for the rest of the year,” said David Barclay, a metals analyst at Standard Chartered Plc in London. Gold futures for December delivery advanced $19.20, or 2 percent, to $997.70 an ounce on the New York Mercantile Exchange’s Comex division, after earlier gaining as much as 2.1 percent to the highest price for a most-active contract since Feb. 24. The dollar index, which includes the value of the euro, yen, U.K. pound, Canadian dollar, Swedish krona and Swiss franc, was at about 78.5 at 3:55 p.m. on ICE Futures U.S. in New York. The index last topped 80 on July 15, when gold touched $942.30. “I suspect that with the buck capped under 80 on the index, countries such as China are preparing for a dollar debacle,” Ralph Preston, a Heritage West Futures Inc. analyst in San Diego, said by e-mail. “Gold looks poised to make a real run at the $1,000 mark,” Miguel Perez-Santalla, a Heraeus Precious Metals Management sales vice president in New York, said in a note to clients. The metal is poised for the biggest weekly advance in more than four months. In London, bullion for immediate delivery climbed $14.15, or 1.4 percent, to $992.65 an ounce at 8:59 p.m. local time. Spot prices last topped $1,000 on Feb. 20, and reached a record $1,032.70 in March 2008. “The next trending step higher is under way” for gold, SEB AB analysts in Stockholm said today in a report. The metal may rise to $1,112, according to the report. Silver for December delivery jumped 92.5 cents, or 6 percent, to $16.29 an ounce in New York, after touching $16.31 earlier, the highest price since Aug. 7, 2008. In London, silver for immediate delivery climbed 4.8 percent to $16.14 an ounce. “Gold prices continue to surge higher as safe-haven buying pushes prices,” Suki Cooper, a Barclays Capital analyst in London, said in a report. Bullion rose to $983 in the London afternoon “fixing,” the price used by some mining companies to sell their output, from $982.50 in the morning fixing. Gold futures have climbed 13 percent this year as the dollar index slipped 3.5 percent. The MSCI World Index of developed-country equities jumped as much as 0.7 percent today after yesterday falling to the lowest level in almost two weeks. “Investors are still worried about a potential correction in the stock market,” London-based broker ODL Securities Ltd. wrote today in a report. A private report showed U.S. service industries contracted at a slower pace in August than forecast, adding to signs that an economic recovery is emerging. Research firm Retail Metrics said sales at U.S. merchants dropped 2.3 percent last month at stores open at least a year, less than anticipated. The decline indicates consumer spending remains weak. Unemployment continues to rise as more U.S. workers filed first-time claims for jobless benefits last week than forecast, government figures show, indicating companies remain focused on curbing costs. About 570,000 initial unemployment claims were made last week, the Labor Department said today in Washington. That topped the 564,000 median forecast of economists surveyed by Bloomberg News. Holdings of bullion in the SPDR Gold Trust, the biggest exchange-traded fund backed by the metal, increased 1.53 metric tons to 1,063.36 tons as of yesterday, data on the company’s Web site showed. Gold held in ETF Securities Ltd.’s exchange-traded commodities rose by 3,283 ounces to a record 7.99 million ounces yesterday, according to its Web site. Sept. 4 (Bloomberg) -- The dollar traded near a one-week low against the pound before a U.S. government report forecast to show employers eliminated fewer jobs last month, sapping demand for the greenback as a refuge from the global recession. The yen weakened against 14 of 16 major counterparts on speculation Asian stocks will extend a global equity rally, spurring demand for higher-yielding assets. The euro headed for a fourth weekly loss versus the Swiss franc after European Central Bank President Jean-Claude Trichet said the region’s economic recovery will be bumpy. U.S. employers cut 230,000 jobs in August, a Bloomberg survey of economists shows. The dollar traded at $1.6333 per pound as of 8:29 a.m. in Tokyo from $1.6319 in New York yesterday, when it fell to $1.6413, the lowest level since Aug. 25. The U.S. currency bought 92.71 yen from 92.64 yen, and was poised for a fourth weekly loss, the longest stretch since December. The euro bought $1.4257 from $1.4252 in New York yesterday, and fetched 87.29 British pence from 87.29 pence. Europe’s single currency was at 1.5145 francs from 1.5144 francs. The Labor Department may say today the U.S. unemployment rate rose to 9.5 percent last month, matching the highest level since 1983, according to the median estimate in a Bloomberg News survey of 77 economists. Employers cut 247,000 workers in July. U.S. Treasury Secretary Timothy Geithner told reporters on Sept. 2 in Washington that it’s “too early” for the Group of 20 nations to scale down efforts to boost growth. A meeting of G-20 finance ministers and central bankers begins today in London. Japan’s currency may decline for a second day versus the euro as futures on the Nikkei 225 Stock Average expiring in September closed at 10,235 in Chicago yesterday, higher than 10,230 in Osaka. The MSCI World Index gained for the first time in four days yesterday, rising 0.5 percent. Benchmark interest rates of 0.1 percent in Japan and as low as zero in the U.S. compare with 3 percent in Australia and 2.5 percent in New Zealand, attracting investors to assets in the South Pacific nations. The euro headed for its first weekly decline versus the pound since Aug. 7 after ECB’s Trichet warned yesterday of a “rather uneven” recovery even as the central bank raised its growth forecasts. The bank left its target lending rate at a record low of 1 percent. ECB officials are in no rush to withdraw emergency stimulus, said Trichet at a press conference in Frankfurt. The central bank did raise its economic forecasts for the 16-nation euro region to predict growth of about 0.2 percent in 2010 instead of a 0.3 percent contraction. FKLI Aug Futures contract surge 9 points higher to close at 1177 levels as compare to previous trading session to with a total of 3,739 lots traded in the market. FKLI continue to rebound strong as regional indices especially Hang Seng indices were traded firm during trading sessions. Technically, FKLI seem manage to breach upper resistance trend line at 1176 regions despite were open below support trend line at 1165 levels. Based on our technical analyst, our opinion suggests FKLI would turn bullish provided if resistance levels at 1178 and 1182 were violated during trading session. Traders were advice to hold long only with condition that resistance levels were violated; else, short position would be more preferable. 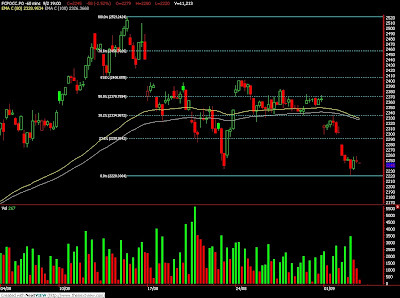 Support levels were seen at 1168 and 1161.5 regions. CPO 3rd month Nov futures contract fall RM27 as compare to previous trading sessions to close at RM2218 with a total of 7,323 lots traded in the market. CPO price was traded sideways in most of the trading hours as soybean oil and crude oil were not traded actively during electronic trading sessions. 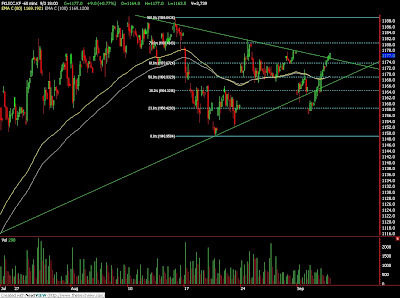 Technically, CPO price seems fail to break 23.6% Fibonacci retrace levels at RM2256 regions. Based on our technical view, our opinion suggests CPO price riding on the bear rally in the coming trading session provided resistance levels at RM2235 and RM2256 were not violated during trading session. Traders were advice to hold short position in the coming trading session while be cautious around support levels at RM2200 and RM2176 regions. Sept. 2 (Bloomberg) -- OPEC will leave oil production targets unchanged when it meets next week in Vienna after prices recovered, the group’s president said. Botelho de Vasconcelos’s views chimed with an official from a Persian Gulf member of the Organization of Petroleum Exporting Countries who said today the group would probably hold quotas steady to avoid derailing the global economic recovery. The official declined to be identified by name because a final decision hasn’t been made. OPEC is holding its third meeting of the year on Sept. 9 in Vienna. The group hasn’t altered output targets since it agreed last year to reduce total production for its 11 members with quotas, excluding Iraq, by 4.2 million barrels a day to arrest plunging prices as the world fell into recession. Oil prices reached a record $147.27 a barrel in July 2008 before plummeting to less than $40 in December. Crude has recovered this year to around $70 a barrel, a price ministers have said is fair for consumers and producers. Members’ compliance with its record output cut slipped for a fourth consecutive month in July as prices recovered, giving an implementation rate of 67 percent, OPEC said in its most recent monthly report. The 11 OPEC members with quotas pumped 26.055 million barrels a day in August, 1.21 million more than their collective target and 20,000 barrels a day up from the previous month, according to estimates in a Bloomberg survey published yesterday. OPEC countries that are producing above their quotas, such as Iran, Angola, Ecuador and Venezuela, will be encouraged to comply with their agreed output limits, the Persian Gulf official said. Oil ministers from Qatar, Kuwait and Iraq expressed support in recent days for leaving quotas unchanged, even as oil stocks remain high. The focus should be on returning the global economy to growth rather than higher stock levels, the official said. Sept. 3 (Bloomberg) -- Oil traded little changed near a two-week low after a report on U.S. job losses and a lower-than- forecast gain in factory orders spurred concern the global economic recovery may be slowing. The number of jobs in the U.S., the world’s biggest oil user, fell by 298,000 in August, ADP Employer Services said yesterday. A drop of 250,000 was forecast. Orders placed with U.S. factories gained 1.3 percent in July, the Commerce Department said. They were estimated to rise 2.2 percent. Crude oil for October delivery traded at $68.25 a barrel, up 20 cents, on the New York Mercantile Exchange at 8:28 a.m. Sydney time. Yesterday, the contract settled unchanged at $68.05, the first time this has happened since Nov. 24, 2006. Prices have gained 53 percent since the start of the year. U.S. stocks fell for a fourth day, the longest losing streak for the Standard & Poor’s 500 Index since May. The S&P 500 slipped 0.3 percent to 994.75 in New York and the Dow Jones Industrial Average lost 29.93 points. Brent crude oil for October settlement declined 7 cents to $67.66 a barrel yesterday on the London-based ICE Futures Europe Exchange. It was the lowest settlement since July 29. Sept. 3 (Bloomberg) -- The yen traded near a seven-week high against the euro before a European report estimated to show retail sales fell in July from a year ago, backing the case for the region’s central bank to keep interest rates low. The yen was also close to its strongest level in seven weeks against the dollar amid speculation a Japanese government report tomorrow will show capital spending declined for a ninth- straight quarter, boosting demand for the relative safety of Japan’s currency. The euro traded near a two-week low against the dollar before today’s meeting of the European Central Bank. The yen traded at 131.64 per euro at 8:38 a.m. in Tokyo from 131.54 in New York yesterday, when it rose to 131.04, the highest level since July 15. The currency was at 92.23 per dollar after earlier climbing to 92.09, the strongest level since July 13. The euro bought $1.4273 from $1.4264. It reached $1.4178 on Sept. 1, the lowest level since Aug. 19. The 16-nation euro region’s retail sales fell 2.2 percent in July from a year earlier, after a 2.0 percent drop in June, according to a Bloomberg News survey of economists. The European Union’s statistics office will release the report in Luxembourg later today. The ECB will keep its main refinancing rate at a record low of 1 percent at its meeting today, according to all 58 analysts surveyed by Bloomberg News. Policy makers have cut the benchmark interest rate, flooded banks with cash and started buying 60 billion euros ($86 billion) of covered bonds to revive lending. The yen appreciated versus the euro yesterday as the payroll report from ADP Employer Services highlighted the risk that consumer spending, which accounts for 70 percent of the U.S. economy, may be slow to gain traction in coming months. Companies eliminated 298,000 workers in August after a revised drop of 360,000 in the previous month, ADP reported yesterday. The median forecast of 32 economists surveyed by Bloomberg News was for a decrease of 250,000. “If the fears over the consumer sector elevate and elevate swiftly, that could lead to a bit of equity capitulation, which translates to favorable dollar and yen movements as long as we’re in a risk-relevant environment,” said Jessica Hoversen, a fixed-income and foreign-exchange analyst in Chicago at MF Global Ltd., a brokerage firm. Employers in the U.S. cut 230,000 workers last month, the smallest decline in a year, according to a separate Bloomberg survey of economists before the Labor Department’s payroll report tomorrow. The unemployment rate is expected to increase to 9.5 percent. Japan’s Ministry of Finance may say tomorrow that Japanese companies cut capital spending, excluding software, by 23.0 percent in the second quarter, following a 25.3 percent decrease in the previous quarter, another Bloomberg survey showed. CPO 3rd month Nov futures contract plunge another RM58 as compare to previous trading sessions to close at RM2245 with a total of 11,213 lots traded in the market. CPO price was traded weak as crude oil and soybean oil were trade weak during overnight and electronic trading. Technically, CPO price manage to penetrate previous low at RM2234 levels but manage to complete target at 61.8% at RM2224 in the hourly chart. Based on our count, we suggests CPO price would likely rebound in the coming trading session provided support levels at RM2220 and RM2200 were not violated during trading session. 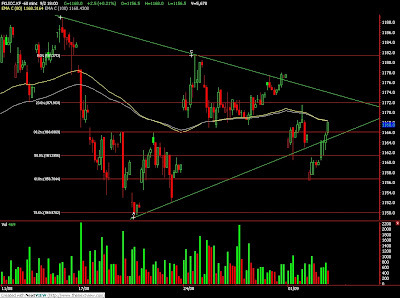 Traders were advice to hold long position with extra cautious around resistance levels at RM2230 and RM2334 regions. FKLI Aug Futures contract rebound 2.5 points higher to close at 1168 levels as compare to previous trading session to with a total of 5,678 lots traded in the market. FKLI rebound strong despite regional indices and Dow Jones overnight closing were traded weak during trading sessions. Technically, FKLI false break down from the symmetric triangle support trend line with support level seen at 1160.5 in the hourly price chart. 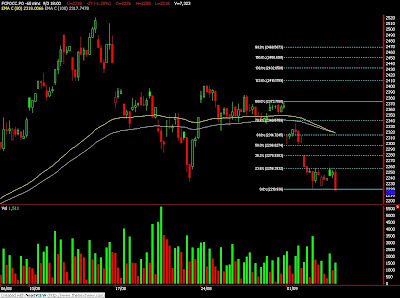 Based on our technical knowledge, FKLI seems supported around support levels at 1157; 150% and 61.8% Fibonacci projection levels. Our humble opinion suggests FKLI would trade lower provided resistance levels at 1171.5 and 1178 were not violated during trading session. Traders were advice to hold short position with condition resistance levels were not violated while be extra cautious around support levels at 1157 and 1150 regions. Sept. 1 (Bloomberg) -- The Organization of Petroleum Exporting Countries reduced oil output for the first time in five months in August, led by a decline in Iraq, a Bloomberg News survey showed. Production averaged 28.445 million barrels a day last month, down 40,000 from July, according to the survey of oil companies, producers and analysts. The 11 OPEC members with quotas, all except Iraq, pumped 26.055 million barrels a day, up 20,000 barrels from the previous month and 1.21 million more than their target. Crude prices have more than doubled from a four-year low of $32.40 a barrel reached the end of last year, which caused OPEC to curb production. Oil has traded between $65 and $75 since July 31. Prices today fell $1.91, or 2.7 percent, to $68.05 a barrel on the New York Mercantile Exchange. “Prices are still flirting with $70 nearly a year after they started making cuts, so you have to say they have done a pretty good job,” said Sarah Emerson, managing director of Energy Security Analysis Inc. in Wakefield, Massachusetts. OPEC agreed at three meetings beginning in September 2008 that the 11 members with quotas would trim output by 4.2 million barrels a day to 24.845 million. The group is scheduled to meet and discuss production levels in Vienna on Sept. 9. Output cuts have left OPEC with 6.055 million barrels a day of spare capacity, the survey showed. Saudi Arabia can increase output by 2.76 million barrels, the most of any member. Iraqi oil output fell 60,000 barrels to 2.39 million barrels a day in August, according to the survey. July production was revised 95,000 barrels higher. Saudi Arabia, Kuwait and Qatar were the only OPEC members to keep within their targets in August. Saudi Arabia, OPEC’s biggest producer, pumped 8.04 million barrels of crude a day, up 20,000 barrels from the previous month. The increase left production 11,000 barrels a day below the kingdom’s quota of 8.051 million. Kuwaiti output was unchanged at 2.2 million, according to the survey. Output was 22,000 barrels a day lower than the country’s quota. Qatar, the second-smallest producer in the group, pumped 723,000 barrels a day in August, up 18,000 barrels from July and 8,000 barrels below its target. Iranian output fell 30,000 barrels a day to 3.76 million in August, the biggest decline of any member, the report showed. The country, OPEC’s second-biggest producer, pumped an average 424,000 barrels a day above its target, the most of any member. Nigeria’s output rose 30,000 barrels a day to an average 1.78 million. Under President Umaru Yar’Adua’s amnesty program, which started Aug. 6, fighters in the oil-rich Niger Delta had 60 days to give in their weapons. Attacks by armed groups in the region have curbed exports since 2006. The country exceeded its target by an average 107,000 barrels a day. Angola increased production by 25,000 barrels to 1.835 million barrels a day, the most since November. The gain left output 318,000 barrels above the nation’s target. Angolan exports are scheduled to rise. Sixty-two cargoes totaling 59.1 million barrels, or an average of 1.903 million barrels a day, are scheduled to load in October, preliminary shipping programs show. That is the highest since December 2008 and compares with 58 cargoes, or 1.854 million barrels a day, planned for September. Sept. 2 (Bloomberg) -- Oil rose from a two-week low after an industry-funded report showed a decline in crude stockpiles in the U.S., the world’s biggest energy consumer. Oil snapped two days of losses after the American Petroleum Institute said in a report late yesterday that crude supplies dropped by 3.19 million barrels last week, bolstering optimism fuel demand is rebounding. A report by the U.S. Energy Information Administration later today is likely to show stockpiles declined, according to a Bloomberg News survey. Crude oil for October delivery gained as much as 44 cents, or 0.7 percent, to $68.49 a barrel on the New York Mercantile Exchange and traded at $68.10 at 9:54 a.m. Sydney time. Yesterday, the contract fell 2.7 percent to $68.05, the lowest settlement since Aug. 17. Prices climbed as much as $1.41 a barrel yesterday when reports showed that manufacturing in the U.S. and China, the second-biggest energy consumer, expanded in August. The U.S. and China are responsible for more than 30 percent of global crude- oil demand. Crude inventories dropped to 343.5 million barrels in the week ended Aug. 28, the API report showed. The Energy Department’s EIA may say supplies declined by 900,000 barrels from 343.8 million, according to the median of responses from 11 analysts. Brent crude oil for October settlement gained 14 cents, or 0.2 percent, to $67.87 a barrel on the London-based ICE Futures Europe Exchange at 10:08 a.m. in Sydney. The contract dropped $1.92, or 2.8 percent, to $67.73 yesterday. Gasoline supplies fell 2.81 million barrels to 206.9 million last week, the API report showed. Inventories probably fell 900,000 barrels, a sixth weekly decline, according to the Bloomberg survey. Gasoline for October delivery gained 0.78 cent to $1.79 a gallon in New York at 9:23 a.m. Sydney time. Yesterday, the contract fell 2.77 cents to end the session at $1.7822. Sept. 1 (Bloomberg) -- Gold gained after reports showed factories in the U.S. expanded in August, helping to lead the economy out of the worst recession since the 1930s, and purchases of previously occupied homes increased in July. The Institute for Supply Management’s factory gauge rose to 52.9, topping forecasts, from 48.9 in July, the Tempe, Arizona- based group said today. The index rose above 50, which indicates expansion, for the first time in 19 months. The National Association of Realtors reported a 3.2 percent gain in an index of home-sale contracts, more than anticipated, in July. “This morning’s positive manufacturing report is lifting the price of gold,” Ralph Preston, a Heritage West Futures Inc. analyst in San Diego, said by e-mail. If the metal closes above $960 an ounce, “that should spark trending price action” to $975 an ounce, he said. Gold futures for December delivery gained $3, or 0.3 percent, to $956.50 an ounce on the New York Mercantile Exchange’s Comex division. The most-active contract slipped 0.2 percent in August, the second decline in the past three months. Bullion for immediate delivery in London climbed $4.83, or 0.5 percent, to $956.08 an ounce at 8:41 p.m. local time. Spot gold slid 0.3 percent last month after rising 3 percent in July. “If gold is set to make much further gains from current levels, either inflation, or the fear of inflation, must increase or the dollar needs to fall much further,” John Reade, UBS AG’s head metals strategist in London, said today in a note. The dollar rose as much as 1.1 percent against the euro, erasing an earlier decline of as much as 0.3 percent. Data showing an August contraction by Europe’s manufacturers stoked investor concerns that the recession may linger on the continent. Gold climbed to $955 in the London afternoon “fixing,” the price used by some mining companies to sell their output, from $949.75 in the morning fixing. Bullion held in ETF Securities Ltd.’s exchange-traded commodities reached a record 7.989 million ounces on Aug. 28, from 7.96 million ounces the day before, according to figures on the company’s Web site. Holdings in the SPDR Gold Trust, the biggest exchange-traded fund backed by the metal, were unchanged for a fourth day at 1,061.83 metric tons as of yesterday. The U.S. Mint sold 82,000 one-ounce American Eagle gold coins last month, down 4.7 percent from July, according to the mint’s Web site. Sales of one-ounce American Eagle silver coins slid 24 percent to 2.13 million last month. Silver for December delivery gained 13.7 cents, or 0.9 percent to $15.06 an ounce in New York. The metal climbed 7.1 percent in August, the second straight monthly increase. Sept. 2 (Bloomberg) -- The yen rose to a seven-week high against the euro on speculation Asian stocks will extend a global equity slide amid concern that U.S. financial institutions will incur more losses. Japan’s currency gained versus all of its 16 major counterparts after CIT Group Inc. said it is deferring interest payments on subordinated bonds due in 2067 because efforts to cover the payments have been unsuccessful. The euro was close to a two-week low versus the dollar after German Finance Minister Peer Steinbrueck said financing conditions may deteriorate when the nation’s economy recovers. The yen advanced to 131.51 per euro as of 8:45 a.m. in Tokyo from 132.19 in New York yesterday, after earlier reaching 131.46, the highest level since July 15. Japan’s currency rose to 92.55 per dollar from 92.92. The euro traded at $1.4208 from $1.4224 in New York yesterday, when it touched $1.4178, the weakest level since Aug. 19. The British pound declined to $1.6124 from $1.6160. Japan’s currency strengthened for a seventh day versus the euro after the Standard & Poor’s 500 Index fell 2.2 percent yesterday. U.S. banks on the West Coast still face credit deterioration and higher loan losses, said analysts at RBC Capital Markets. “Many of these banks may still not have enough capital and reserves” to cushion against writedowns from worsening real estate market, analysts Joe Morford and David King wrote in a research report. The yen tends to gain in financial turmoil as the nation’s trade surplus reduces reliance on foreign capital, while the dollar benefits from its status as the world’s main reserve currency. Futures on Japan’s Nikkei 225 Stock Average expiring in September closed at 10,285 in Chicago yesterday, 2 percent lower than 10,500 in Osaka. FKLI Aug Futures contract fall 3.5 points lower to close at 1165.5 levels as compare to previous trading session to with a total of 4,452 lots traded in the market. FKLI rebound as regional indices were traded higher but fall lower as Dow Jones electronic trading plunge before market closed. 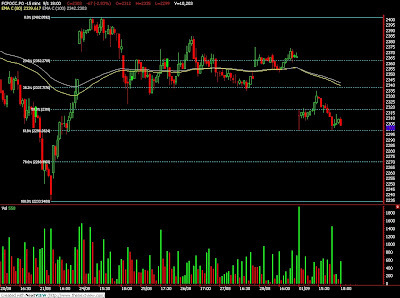 Technically, FKLI manage to rebound 61.8% Fibonacci retrace levels at 1171 regions after well hold above support levels at 1160.5 Based on our technical view, our opinion suggests FKLI is possible to rebound where resistances levels were seen at 1170.5 and 1174 regions provided support levels at 1163 and 1157 were not violated. 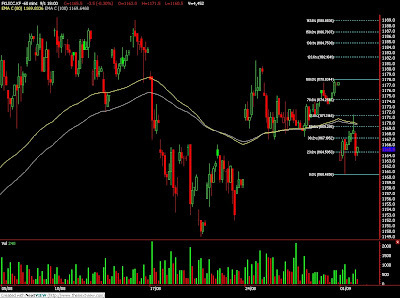 Traders were advice to hold short position as our opinion suggests FKLI is more certain riding on a bear rally. CPO 3rd month Nov futures contract lose RM67 as compare to previous trading sessions to close at RM2303 with a total of 10,203 lots traded in the market. CPO price was traded lower as crude oil and soybean oil overnight were traded weak during overnight trading session. Technically, CPO price temporary supported above 61.8% Fibonacci retrace levels at RM2298 level while manage to rebound 38.1% Fibonacci retrace levels at RM2327 regions. Based on our technical point of view, our opinion suggests CPO is possible to test support levels at RM2298 and RM2272 provided resistance levels at RM2335 and RM2357 were not violated. Traders were advice to hold short position but be cautious as bear rally might end in the coming trading sessions.